2001 . 2002 . 2003 . 2004 . 2005 . 2006 . 2007 . 2008 . Hello again: happy new year! After a year of so of using blogs instead of this "occasional letters" page, I've decided to restart this page. I may or may not also continue with the blogs, but I like the idea of having a simple single page for occasional entries like this. Of course, this means that there's a big gap in the sequence for 2008 (and part of 2007) so I may have to do a "review of the year" to fill in that blank. However, as always, I am going to start the year's diary by saying I just don't seem to be able to find the time to... well, you'll know the rest if you've been following previous years' entries! I have not yet been successful in working out how to make the time I want to do all the things I want. Still trying. Watch this space! Debbie continues her policy of rescuing and saving stray and injured wildlife, and for the forseeable future we seem to be looking after Dovey, the Dove. He has a broken wing so can't fly, but happily potters around the living room doing Dovey things and is getting on famously with the dog and cats and cockatiel. We rescued another pigeon just before Christmas, and that one recovered and flew off into the great blue yonder. Dovey seems to like his home comforts, though, and doesn't look set to leave us if he can help it. Dovey stomping along the back of the sofa. Still spotting, after all these birds! Debbie is still into her birdspotting, and so Gus and I are being taken on lots of walks in Debbie's favourite spots, which now include Cannock Chase and the Wirral. We're all happy because we all like being out and about in the fresh air, and also it gives me an opportunity to play with my new camera! We've seen some exciting new birds recently (if you are excited by new birds), including Hawfinches, Waxwings and Twites. 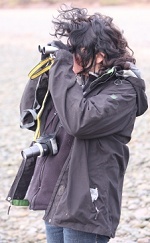 Here's a picture of Debbie in Birdspotting mode! 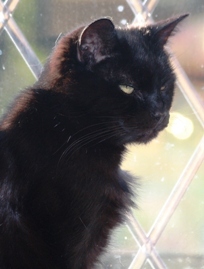 It's nice to have a bit of sunshine and cheer back in the countryside after a few grim weeks for us: Merve the number-1 cat has been really ill and we had her put to sleep last week, so we're a bit miserable about that. Meanwhile, during last semester I have been setting up (with some problems along the way) a new PC, camera, some software etc that might help me to tidy up this increasingly out-of-control website. Watch this space, but don't hold your breath! The daffodils and the tulips are pretty much all gone now, and the bluebells are in full swing. This is the first year I've been able to recognise a Chiff Chaff (is that how you spell it?) but they are in full s(w)ing too! May be it's because the countryside looks so nice in May that I always feel the urge to do a bit of model railway in the summer. This year I will be able to get down to it with more space to use, as we've had the loft boarded! I'm in the thick of re-arranging the house now there's somewhere to put stuff. It was unfortunate timing to have work going on, as we have just got a new little cat and we were worried the bumping and banging would upset her. It didn't, she's pretty brave. We've called her "The General". She made friends with Gus straight away, and even though we've had her less than 2 weeks the other cats seem to have pretty much accepted her already. She's 6 months old and we got her from the Cat's Protection League. Debbie has a new van! So long (sadly) to the old van that was making "the end of the world is coming" noises, and hello to this sparkly new van. I bet it stays this clean for a long, long time, and that Debbie will wash it regularly. This is a view I am seeing quite a lot of: the ladder up into our newly cleared loft! Here's Gus looking particuarly handsome and intelligent. He takes after me. These bunks came in 1,257 pieces: delivered afternoon, assembled evening, slept in by niece and neice's cousin (what does that make her to me?) that night. Blisters the next day from so much screwing-bits-of-wood-together! Not my choice of pale green duvet covers! Busy as always at work, and also at home recently with some decorating and refurbishing. I also made a web site for Top Farm Livery where Debbie keeps Meg. So, what's been happening here? Well, to start with work I got a pay rise (hooray!) with a promotion up the salary scale by what they call a "contribution point". Debbie and I have started working on our book project "Practical Techniques in Physical Geography" for Routledge. I have had a couple of little papers come out (with me as co-author) and had the new paperback edition of my book "Glacier Science and Environmental Change" released. I have been spending a lot of time in the "University Examinations Appeals Committee", of which I am Chair and which sees a lot of its business at this time of year. I was involved in judging the University's "Innovation Awards" winners, and have been spending time reviewing all the Physical Geography course stuff for next year... which starts far too soon! Away from work I've been trying to carry on getting the house a bit sorted now the loft is done, and I've also been trying to make time to do a bit of drawing and painting. I haven't really done any for years, and would like to get back into it. It's dificult to find time with so much photography, bird spotting, model railway, writing, etc etc!! I was partly prompted into it because Debbie suggested I draw a picture of the jockey Jimmy Fortune for her friend Lonnie. I had a go, but I'm only pleased with it as a "first attempt after many years"! I've also been trying to get back into oils and acrylics, trying to work out which one is good for what. I find myself heading back more in the direction of oils, having experimented just a little with acrylics. Oh, yes, and I discovered IKEA! If you want any Billy or Expedit items assembled, I now have some experience! Here's me admiring my joinery skills. Well, my screwdriving skills, at least. Having got the loft done, the model railway stuff is now out of the back bedroom, and that is now being turned into a more user-friendly office (and studio, if I keep up the old painting!) This photo was taken, by the way, with my splendid new Sigma EX 10-20 lens (a nice wide-angle lens that lets you fit more into the picture: the opposite of a telephoto). I've been experimenting with that in my spare time. Oh, and with a new Canon 50D, too! And I can't finish this post without showing you Debbie's latest painting. She's never done people before, always doing horses or landscapes, so she did me as her first attempt. Pretty good, I'd say. I think she should get a better-looking model next time, though! We had a fantastic time in Scilly. It was even warm and sunny enough for Debbie and Gus to go swimming. There are some more photos HERE. We're all booked up to go again next year! As usual we're both having a busy autumn semester at work, but for once we're also managing to fit in some other stuff too. For a start we had a big proper holiday in The Isles of Scilly in September, and even after semester started we've both managed to do a bit of painting, amongst other things. Debbie has done some great new horses and I've started a whole new web page for Debbie's Paintings. I have been painting the composer Gustav Mahler, of whom I did some sketches more than 25 years ago... I know it's taken a long time to get round to carrying on with that project, but here's the latest version. Bigger version here. After nice visits to friends and family we settle down to a week or so of "doing nothing much" over Christmas and New Year. Of course there are still the animals to look after: walking and mucking out in all weathers. 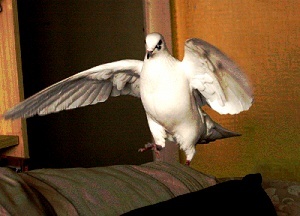 Debbie is now looking after two injured doves along with the dog, the horse, the three cats, the cockatiel and the two tanks of fish. Debbie continues to develop her painting: she's being very prolific at the moment, painting every day. We will either need more walls or a market stall soon! Our friends Debbie and Mart suggested I try out this new look. It certainly keeps the cold out. I thought perhaps I might go for the blond look, though. I'm reading a nice edition of Captain Scott's Journals, which Debbie got me for Christmas: appropriate with the cold weather we've been having. I've also been spending time figuring out how to get music from my old casette tapes onto my new iPhone. Next for the vinyl and the 78s! Very pleased with my new phone, by the way.